Vegan in 2014? Here's my advice. I don't need a recipe for beans, greens, and pasta, one of our ten often-served meals. I just ran across the Veganuary website, which promises to help people who want to become vegan in January 2014. Check it out, then come back here, because I have more advice. It's hard to fathom someone not knowing how to be vegan—it's like not knowing how to ride a bike. When you've never thrown yourself over a two-wheeler and tried to maintain your balance as you hurl down the pavement, the idea seems mad. But once you've tried it a few times, rode your bike to school and back, you're a pro. Likewise, the idea of going all day without eating animal food seems daunting, until you've tried it for a few weeks. For me, it's second nature. Eating animals or their by-products—milk, eggs, cheese, etc.—is completely alien to me. Yet my meals would look pretty normal to most everyone. I ate Sloppy Joes last night, with a spinach salad in a nod to healthy eating, and whole wheat buns. The night before we had roast, gravy, and mashed potatoes, with oven-roasted broccoli and runner beans (drizzled with citrus flavored balsamic vinegar) for sides. Last week we had fajitas, and I made a seitan roulade stuffed with mushrooms for Christmas dinner, accompanied by all the usual sides. Here's the startling fact: Most families have ten meals they eat on a regular basis, only rarely incorporating other dishes into their rotation. You might be different—but I bet you still have about ten dishes you make on a regular basis, no cookbook or recipe necessary. Something you can throw together without a special trip to the supermarket. Spaghetti, tacos, burgers, stir-fry—you get the drift. We make all those dishes pretty regularly, using vegan ingredients like mince (hamburger "meat") or fake chicken or beef strips for fajitas. Find ten dishes you normally eat, and figure out how to veganize them. After you do this, you'll be more than halfway on your way toward living the vegan good life. If you don't like the sound of tofu tacos (I certainly don't) find another substitute. Maybe beans, or maybe vegan crumbles. If you don't like one brand of crumbles, try another. You'll find wide variation in taste and more importantly, texture. Likewise with dairy substitutes. Most vegan cheese isn't all that good, or at least melty, but there are some that are worth checking out. But I've discovered I don't really miss cheese, since my dishes are so flavorful without it. Try making a bechamel sauce with soymilk if you want a creamy addition to a casserole. Another fact: most non-vegan recipes adapt very well to vegan additions, such as non-dairy margarine and soy milk (or rice or nut milk). Be careful you're not using sweetened soymilk or nut milk. And do make sure your margarine is non-hydrogenated—that is, free of trans-fats. It's pretty easy to find such a thing nowadays, either in the UK or the US. Seek out specialist on-line grocers for hard to find ingredients. Amazon delivers almost any vegan product, right to your door. Here in the UK I've found Vegusto makes superb vegan products, including meats, sausages, lunch slices, and the best tasting cheeses I've ever had—including dairy cheese. This vegan olive cheese spread from Saf, based on cashews, is better than any dairy-based cheese spread. Here's another fact: After I gave up butter, which I used almost exclusively, thinking it was far superior to lowly margarine, I discovered that after about a month I couldn't stand the taste, or even the smell of butter. It smells off, which indeed it is—think about it: it's made from milk that came out of a cow months ago, and has just been sitting around getting rancid all this time. If you give me a cookie that's made with butter, I generally make a face. I'm not a supertaster, but the wang of butter will put me off the whole cookie. So don't try giving up butter one day, then switching back the next. Like Dean Ornish says, when you switch from whole milk to fat-free, if you keep switching back and forth every day, in an effort to cut back, you'll never forget the taste of whole milk and fat-free will always make you feel like you're missing something. Go whole hog. (Well, not really—pork isn't vegan, but Vegusto has some great sausages.) Give up dairy, including butter, for a month, and you'll find you actually prefer the alternatives. You'll no longer think of them as "substitutes" and instead they'll be your first choice. Last Christmas, my daughter made deviled "eggs", using a recipe from Vegan Crunk. Now, some people call bacon their gateway meat product—they can sustain a vegan lifestyle until they pass a plate of bacon. Not me. You can keep your bacon. But deviled eggs—I would seriously consider popping one of those in my mouth if you passed me a plate, preferably one of those special deviled egg plates like your grandmother had. Not any more. Now that I've had vegan deviled eggs, I'll have to say no thanks to their chicken-produced counterpart. The vegan version is better. Honestly. This is perhaps the most important advice I can give you: if you're constantly considering your vegan diet as second-best, as a substitute for the "real" thing, you'll never be satisfied. You need to think of the exciting possibilities instead of the dreary sacrifices. You're not making a sacrifice in any way by choosing a vegan diet. You're simply replacing animal food with plant food. Very delicious plant food that can stand up to non-plant food any day, as long as you are willing to give it a chance. Go on, give peas a chance. 2014 year vegans become mainstream? What are you doing on Meat Out day? I wrote a review of my latest veggie excursion, to World Food Cafe near Covent Garden. Pretty soon I'm gonna have to stop dissing British vegan food, if places like World Food Cafe keep turning up. And later I may post a recipe for the yummy polenta with butternut squash and black beans I cooked last night. If you're trying to go meat free, here are some tips I posted last year. They're still fresh, however, so go save a cow and have a happy MeatOut Day! I posted the soup recipe I made last night. I also discovered the reason I blog about food: Sometimes I make something and it's so good I want to tell someone about it. This was one of those times. Hope you all had a nice Thanksgiving. We had a quiet day. I made focaccia with potatoes, and decided to make a corn soup from the vast quantities of corn in my freezer. It was delicious, and if you consider that corn is a traditional Native American dish, quite the T-day dish. You can find out how here. I kind of like not having the pressure of a full-blown Thanksgiving meal to prepare. You all have my sympathy, today, anyway. On Saturday I'm making a non-turkey loaf and bringing it to a friend's Thanksgiving celebration, delayed by two days due to British work schedules. And top on my list of what I'm thankful for: That I'm not caught up in the terror in Mumbai. My heart goes out to those who are. If you've ever thought about eating a vegetarian meal in Toulouse, I've written a post for you. Maybe one day I'll get around to blogging about what else I did in Toulouse. There are not, I've discovered, enough hours in the day. Perhaps when we return to Greenwich Mean Time on Sunday that will be fixed. Bet you never saw watercress growing! These are the Sarratt Bottom watercress beds, the last active watercress beds on the Chess River. The warm water from the river (usually 10C or more) is diverted to the beds. The watercress is available at local farmers' markets. It's nice to see where my food comes from. "People should have one meat-free day a week if they want to make a personal and effective sacrifice that would help tackle climate change, the world's leading authority on global warming has told The Observer." That was the front page of the Guardian website today. The expert is Dr Rajendra Pachauri, chair of the United Nations Intergovernmental Panel on Climate Change. But it's one thing to say people should eat less meat; it's quite another to provide resources and education and support on how to do it. Fortunately, we've got that covered. There are tens of thousands of vegetarian recipes on the internet, including my food blog, Wednesday Food Blogging. For more inspiration, and a weekly reminder, you can sign up for Meatout Mondays weekly e-newsletter here. So there's no reason for you not to follow the advice, is there? I wish I could blame it on having a wisdom tooth removed, but my lack of posts over there is due to laziness more than pain, although there might be something more relevant to the fact they're called wisdom teeth. I am feeling less wise than ever. *Whenever I travel all day I write in my head a lovely post about Britain's motorways, and the thought-provoking signage I see. Maybe one day. Today being Wednesday, I posted a couple of things over at Wednesday Food Blogging which you may be interested in, including a rather surprising (for me) restaurant review. For those of you looking for a veggie burger in England, you may find it helpful. From the jaws of disaster, a victory is snatched. A funny thing happened on the way to a lasagna. I managed to bring back a couple of porcini mushrooms from Rome. September and October are porcini season, so the markets had crates of huge porcinis. A couple are all you need for a dish, but one didn't quite make the trip intact, and when faced with a sauté pan, the other shrank into more normal mushroom size. Dried porcinis raced to the rescue, after a quick soak in hot water. Hurdle number one seemed to be solved, at least if I could content myself with only one layer of mushrooms. So this would be a height challenged lasagna. Politically correct and all that. But then my lasagna noodles were stuck together in the middle when I poured off the cooking water. One big mass of pasta, with floppy sides. (Lasagna noodles are wider and shorter here, about 4 by 6 inches, and not ruffled on the edges.) Now, I don't normally cook my lasagna sheets; I just add more water to the tomato sauce. But this was to be a white sauce lasagna, so I thought it best to cook the lasagna first. In trying to pull the sheets apart, I ended up with pieces of lasagna. I layered the bigger pieces on the bottom, then pieced together more bits until I had covered the whole thing more or less. The only thing that worked properly was the bechamel. All hail bechamel! If you try this at home, your mileage may vary. Which may be a good thing. They call it mellow yellow...college food. My daughter sent me a photo of a meal she cooked with her friend during her Fall Break weekend, which she spent in New Hampshire. Her friend is also vegetarian, and they found some bargains at the local grocery store. She really is fortunate, though, having vegan and vegetarian meals available three times a day in the house dining hall (Smith has houses, not dorms). When I was in college I had to settle for french fries and orange juice from the grill in the student union. I also had to walk 10 miles in the snow* to get to class every day, but that's another story. Comfort food, this time with umami. I wanted to make Porcini Gravy with the dried porcini mushrooms my husband brought back from a recent trip to Florence. Plus I had some leftover mashed potatoes in the fridge. And as I spun around the circular shelf in my cabinet, I spied some green lentils. I suddenly envisioned a lentil pie, with mashed potatoes on top and porcini gravy running over the top. Now, if last month was Chipotle Month here at WDIK?, this month will be porcini month. There are similarities—both chipotles and porcinis take your tastebuds a step beyond the plain old. (To put it another way, chipotle is to jalapeno peppers what dried porcinis are to mushrooms. Porcinis are in season now in Tuscany, where they grow wild. It’s easy to find them here, at nearly every supermarket, in their dried form. I’ve never seen them fresh, presumably because they don’t travel well. But dried porcinis, as well as being remarkably versatile, have a unique, woodsy flavour that livens up any recipe. I call this a lentil pie, since it's very similar to shepherd's pie. (The word pie in Britian typically means a savoury pie, not sweet.) It's really more like a casserole, however. I baked it in a small casserole dish, just big enough for two. You can increase the amounts accordingly if you're feeding more than two, or want leftovers. The gravy was plenty for three or four servings, so you don't need to increase that. Corn Maque Choux, served over quinoa: Slimmed down, yet still as authentic as zydeco. I was horrified to pick up this month's Delicious magazine and read Simon Rimmer's recipe for vegetarian gumbo: with sweet potatoes, cabbage, red onions and not a dollop of roux, it resembled no gumbo I've ever had. I'm all down with vegetarian gumbo, of course, but if you're going to veganize a recipe, at least try to keep to its roots. Or call it something else. So it was with no small amount of caution that I attempted to veganize another Cajun staple, maque choux (pronounced "mock shoe"). You probably haven't heard of it; it never became popular when Cajun food spiraled into trendiness during the nineties. But maque choux is much more likely to be found in Grandma's Cajun kitchen than shrimp etoufee, or K-Paul's mistake-made-good, blackened redfish. It's also naturally vegetarian, and a simple country dish, though sometimes sausage was tossed in when times were flush. Maque choux is basically corn stew. It's often served over rice, but I decided to serve mine with quinoa, which is much higher in protein. I managed to get my hands on some fresh corn, which as I've complained before, is very dear here. But with the end of summer comes the corn crop, such as it is. And for maque choux, you want the freshest corn you can get, so fresh milk squirts from the kernels when you slice them from the cob. You also will want to use the Cajun trinity, missing from Rimmer's faux-gumbo: onions (yellow or white), celery, and green bell pepper. I added some chopped tomatoes, since I had them, and of course used soy milk instead of dairy milk and cream. No eggs, either, but I never quite understood what purpose they served. I don't know if K-Paul would approve—I based my recipe on his, since no one knows their way around a Cajun kitchen better than the big man himself. But with zero cholesterol, and a whole lot less saturated fat, my version is a lot less likely to make our waistlines kitchen-sized. That's a good thing, cher. What I did with leftover pintos. I’m finding more of my dishes feature these triple texture whammies. Adding a sauce to the top makes an okay dish even better. When I first made this, I just served the pintos over polenta, with chopped tomato on top for my husband. ** But it was lacking something. So for the next day’s leftovers, I dreamed up the cilantro cream—which took seconds to make, and that seemed to do the trick. Another trick: Since the pintos were already made, the only time-consuming part of this recipe was the polenta. It took 20 minutes to stir, and then normally would need another half hour or more to set. From the package of dried beans, I ended up getting three meals for the two of us, plus my husband had them for lunch one day. A triple pintos week, and a very thrifty one too. *As long as those nasty raw tomatoes are kept out of the mix. ** Truly, some people will eat anything. Improvisation and compromise occasionally produce lovely results. For a recipe with such a long name, Black Bean and Rice Cakes with Chipotle Remoulade and Roasted Corn Salsa (BBRCCRRCS) takes very little time to prepare, especially if you already have the remoulade made (see last week’s recipe). The inspiration came from a menu* I found online, but of course no recipe was included. So I improvised, and improvised some more. Some cilantro (coriander) would have been nice in the salsa, but I didn’t have any. When you’re improvising, you don’t stop to mourn what you don’t have. Next time, sadly, that will probably be fresh corn. Ah well. Improvisation never ends. *Actually, that dish sounds completely different. I improvised the cilantro remoulade and spinach layer right out of it. Guess I'll try that next time! On Sunday afternoon we took a long hike and on the way home my thoughts naturally turned to my next meal. I envisioned the sparse contents of my vegetable bins: a bag of bell peppers, a couple of sweet onions, and a small head of broccoli. By the time we arrived home, I’d come up with the rude outlines of a recipe for stuffed peppers, somehow involving quinoa and onions. Lately I’ve been wanting more quinoa in my life. If you haven’t eaten quinoa before, you really should try it. It’s a high-protein grain from South America, with a slightly chewy texture. It has a taste similar to brown rice, but cooks as fast as white rice. The real star of this show, however, was the Chipotle Remoulade. I first got the idea from an online menu (I like to peruse veggie restaurant menus to get ideas, even if I’ll never visit them.) Instead of mayo, or even vegan mayo, I used silken tofu, a very nice substitute. Beware the canned chipotle pepper, though: it can be very hot! Three were enough for my rather tolerant tastebuds; for most heat-averse people that may be too many. The end result was delicious, one of those texture-flavour combinations I particularly love. (For a side dish, I served corn, which went well with this theme.) And sometime in the middle of the night my husband, hearing the siren call of stuffed peppers, got up and ate the two remaining peppers. I think he liked it too. Fortunately, there was remoulade left over for another meal. Check back next week to see what I did with that. When you're blue, there's nothing like chocolate to cheer you up. On Sunday morning I made Double Chocolate Coconut Muffins before Daughter Number Two left for college, thinking something cheerful was in order. They were so chocolatey I almost did a happy dance right in my kitchen. St John's Wort, move over. Prozac, you're so last decade. Chocolate is what we need more of around here. British researchers used brain scans to investigate subconscious reactions to the confection and found that the pleasure centres of chocolate lovers' brains lit up more strongly in response to the food than those who are less partial. I used Green & Black's industrial strength, 72% baking chocolate. (You can see it scattered on the cutting board.) American tastes may prefer a less intense chocolate. Or not. Read on to see how to light up your brain. This was one of the first vegetarian recipes I ever made, back when my daughters were picky toddlers, and I couldn't afford a cookbook. I cut the recipe out of some long forgotten magazine, and though that scrap of paper was lost, this is one recipe that's easily committed to memory. Over the years it became a family favorite. Even after I veganized it, Rigatoni and Broccoli is still Daughter Number Two's most requested meal. It fits the definition of comfort food perfectly—creamy, hot, and pasta-containing. So, with DNT's departure for college only 3 days away, I made her favorite tonight, Rigatoni with Broccoli. And for even more comfort in a bowl, I made FatFree Vegan's Southern Banana Pudding, served with some Soyatoo whipped cream. Now we have that stuffed, comfortable feeling. I'll fight you for that crumb. 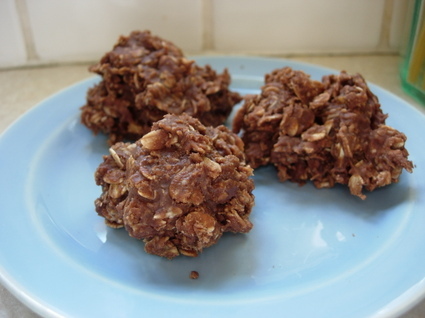 I've been on a quest for the perfect no-bake cookie for a long, long time. When my daughters were young, they attended a co-op preschool in Ohio. At school events, parents would bring in these delicious, simple little bites of chocolate and oatmeal. But no one ever provided the recipe, since, apparently, everyone had it but me. At a vegetarian restaurant in Columbus, I tasted the best no-bake cookie ever. Very chocolaty and scrumptious. It put those well-intended co-op moms' best efforts to shame. I was determined to create such a monument of cookie perfection. But as they say, my mileage varied. I could never produce the same result in my own kitchen, following first one, then another, recipe. When your pantry staples include black beluga lentils, a delicious salad is only 20 minutes away. We've had a lot of potato salad this summer. When I saw these small Piccolo potatoes at the store, I decided once more into the potato salad bowl I'd go. Of course my favorite is Dilled Potato and Green Bean Salad, but I've made it so many times this summer even I'm bored with it. Pantry staples to the rescue. I've had these black beluga lentils for a while now. They're similar to green French (le puy) lentils, and really shine in dishes where their texture and color can be appreciated. When I made a salad with them once, I thought my dinner guest was going to lick her plate. 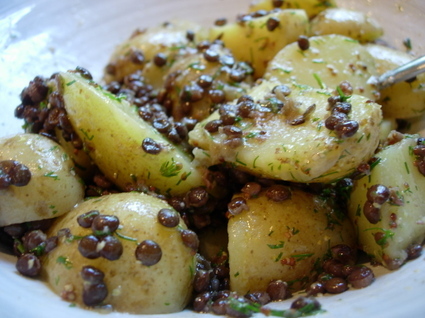 Also, a while back I made a warm potato salad using green lentils, which prompted my daughter to help herself to seconds, and then thirds, until between us we finished the bowl. So I used these beluga lentils and the lovely golden-fleshed potatoes, ending up with a dish that's a bit more substantial than regular potato salad, and a bit more exotic. While I've never envied people who include caviar in their diet, I sure wouldn't mind finding beluga lentils on the menu more often. Recipe below, and don't forget to check out the Recipe Index.